You don't see the blades at first. 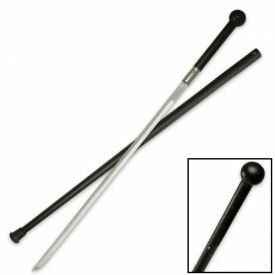 That's because this is the Hidden Blades Baton. 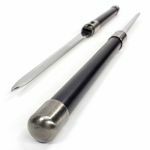 What seems to be a 26" black and silver baton opens up into two 25" long swords. Just slide the push button locking mechanism and pull the swords apart. The stainless steel blades will gleam in the light. The black handles, which are an inch in diameter, will fit easily in your hands. Your party guests will gasp in amazement. This pair of surprise swords is good for infiltration, especially to locations where batons are an expected accessory. 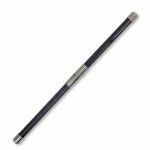 The baton is lightweight (weighing a little less than a pound and a half) and easy to store if a security guard says you have to put it in your car. 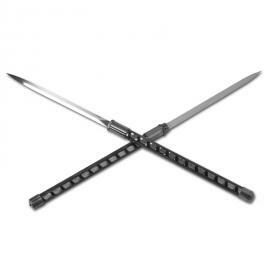 Get your own Hidden Blades Baton and get the fancy weapon that allows you to dual wield. 26" staff separates into two swords. 11.5" and 12" blades, each with with 13" handles (approx). Stainless steel blades (sharp, but not razor sharp). Each sword weighs 10 ounces.